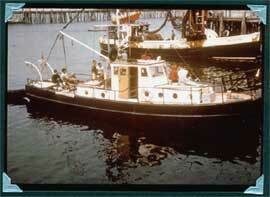 The Kay G was the Sea Rovers first dive boat, and most likely the first “real” dive boat in New England. The Boston Sea Rovers are known throughout the world as the Dive Club that can proudly boast ownership of “The Longest Running Underwater Show on Earth”, but the Club is much more than that. The Sea Rovers are a group of people from diverse and varied backgrounds who share the common bond of a love for diving, and for the world’s waters, and all its inhabitants. They are divers first, and showmen second. In the heyday of the 1950’s, diving was starting to take off, and dive clubs were sprouting up all over the country. Some stood the test of time and are still around, while others faded with the interests of their founding members. It was at this time, in the exciting early days of diving, that a small movement was underway in the Boston area to start a dive club – a dive club that was to be known as the Boston Sea Rovers – and that was destined to become one of the oldest, most respected dive clubs in America, if not the entire world. The club soon decided to meet at the Boston Y, and started to advertise their bi-weekly meetings. Frank Scalli, a paratrooper, had just gotten out of the Army in 1953, and was desperately looking for something to keep him active, and diving seemed like it. During his last few months in the service he had been an aquatics supervisor at a base in Kentucky , where he earned his Water Safety Instructor (WSI) rating, which, as Frank says, was “the most difficult thing I had done in my life; jumping out of airplanes was easy in comparison”. 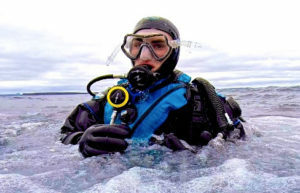 Once out of the military and back in the Boston area, he found one of the few places selling dive gear. He bought a mask, tank and regulator, and took them to a local Y. Since the gear came with no instructions, he jumped into the pool to teach himself. Everything turned out to be fine, except his ears hurt, and he couldn’t figure out why. The next time he tried it, he ruptured an ear drum. He researched the subject as best he could, but all the books that he could find were written by, or for, helmet divers, and offered no help. They talked about equalizing, but did not say what it meant or how to do it. Frank figured that he just had a bad day, and went back three weeks later, when he promptly ruptured the other ear. Finally, additional research put him in touch with Dave Owen, Chief Diver at Woods Hole Oceanographic Institution (WHOI), who explained about ear equalization, and supplied some appropriate reading materials. Scalli asked why more people didn’t know about this new sport, to which Owen explained, “It’s not a sport yet!”. By the summer of 1954, the YMCA had received requests at two other pools from people who wanted to try out their equipment. There were no standards, so Frank wrote out a list of do’s and don’ts. Frank was not an educator or a writer, however, the Y people liked what they read and adopted it (Discover Diving, Vol. 11, No. 2, 1993). Some of the very first Sea Rovers, Joe Hohmann and Bunky Hodge, ready for some weekend lobster and wreck dives off the Kay G.
Although he looked around for other divers, it wasn’t until August of 1954 that he heard about a meeting at the Boston Y, which he quickly attended. A few of the other people he remembered at that first meeting were Joe Cortese and his wife, Walter Feinberg, Jim Cahill, Don DeSantis, and Joe Linehan. At this meeting, or one shortly afterward, the group started meeting as the Boston YMCA Sea Rovers, and a logo was quickly chosen to make it official. There were about a dozen people present. This small but determined group of individuals were excited about diving, and wanted to let other people know about this burgeoning sport. They decided that the best way to inform those interested in the Boston area was to host an exhibition about diving, as first suggested by Walter Feinberg. An ambitious date was selected less than six months away. They started to plan, promote, and pray that it would work. The rest, as they say, is history – the history of the Boston Sea Rovers. Come with us as we walk along the halls of history of this pioneering group of visionary divers who have molded and shaped the direction of diving throughout the United States, and the world, for five decades. 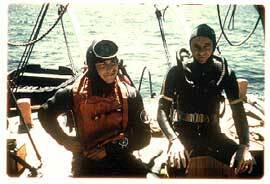 The history of the Boston Sea Rovers is, in many ways, the history of scuba diving.